Russian Itar-Tass: Global Warming Boatpeople To Be Air-Lifted From Sea-Ice-Surrounded Akademik Shokalskiy! 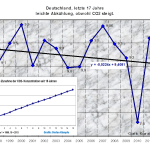 Real Data: 2013 Germany’s Second Coldest In At Least 17 Years…Overall Trend Shows Clear Cooling! Blizzard, “Damn Cold” And Thick Sea Ice Thwart Latest Global Warming Research Ship Rescue Attempt!